- Great video Ron! I am amazed at how well that turned out. - For those who don't know, Sea Hunt Forever 2017 was March 4-5 at Silver Springs, FL. Ron Bentz, Rich Merten, Jerry Lang, Joe Musial, and myself (Eben Brown) were cast members that traveled to Silver Springs Florida from Minnesota. SwimJim Bach wasn't able to attend this year. But, there were 15+ additional divers in the cast who traveled from all over the country to be part of the event. - There were professional photographers from local newspapers as well as the diving community. The second day, several of us were using our personal cameras as well. I got a whole bunch of video of which most of it is not very good... (I think I may only be capable of good video from a selfie stick!). - So, Ron brings down this goofy looking GoPro handle/stand thing and just sets it down at one corner of the Silver Springs pool. And darned if his video doesn't come out capturing everything better than all of my hand held video shots. He even got the cute little fishes that run away when you try to video them. - Right after the beginning there's a brief stretch where we all swim upstream and off camera... This is when we're waiting for a glass bottom boat to come. In the background you can hear Jerry's Porta Sub running. Then, you can hear a choppier sound of the glass bottom boat propeller as it arrives overhead (later it drifts into view). Then you see the divers coming back into camera range doing their knife fights, speargun shooting, etc. Ron is the guy in the silver suit with the twin 72s. I'm in one of the knife fights with Rich notice our great "death spirals" in both directions and underwater judo... We practiced that at the pool before going to Sea Hunt Forever 2017. You can recognize me by the black suit, twin gray 38s with gray bands and very round tank bottoms. Jerry is driving the PortaSub at the beginning. Rich is one of the black suit single 72 tank guys with white hair. I'm not sure if Joe is in this video but if he is, he'll have on triple tanks and silver suit. Toward the end, you'll see a close view of Rich and Ron fighting over a spear gun as I leisurely swim thru the scene looking at my camera. - In the background center left you see three statues. These are remnants of an "I Spy" television episode that was shot at Silver Springs back in the '70s (I think). - BUT... Behind the statues is a "cliff" or ledge that appears in many Sea Hunt episodes... On TV the cliff scenes were usually depicted as very deep even though it is really only 10-15 feet deep. - The whole Silver Springs pool is like an underwater sound stage with props built in. The "cave" that appears in so many episodes is actually the mouth of the spring which is off camera right in this video. The boulders that Mike Nelson hides behind is many scenes are the same ones still present at the Spring today. Remember the episode about catching the prehistoric coelacanth? Those are actually the local bow fin fish which are still present in the spring today. - Great video... Way to go Ron! Some other people need to start posting their videos.. Very cool video. I could see several uses for this film and the stationary style you used to film the various divers. I too hope to see more footage from other sources. Will you be posting any Eben? I think a stationary camera sitting at where the dive float anchor was filming towards the cave would have been ideal filming. I too hope to see more (video)footage from other sources. Will you be posting any Eben? - To tell the truth, I am kind of under-whelmed at the lack of forum participation and comments about this VERY BIG EVENT in the vintage equipment diving community. I had not even gotten home yet and the enthusiasm and discussion over the first postings of pictures and video had begun to cool off. 1. What a truly BIG DEAL the Sea Hunt Forever show is for our diving community. 2. How much time and effort goes into producing videos to post on forums that only a few people bother to contribute anything to... Much less share and disseminate outside the forum for the good of the sport. Thanks for elaborating some on this, Eben. I'm sure its a greater undertaking than we realize, unfortunately. And thank you for pointing out that credit is deserved by many, even those who may not belong to this forum. I wish I could have been involved but I wouldn't have the correct gear to participate anyway. The criteria to participate is a bit high for most vintage divers that I know. However it is something that any vintage Scuba enthusiast can appreciate. It may be something more vintage divers can strive to become a part of too. Will there be future SHF events in the near future? I think this may have been gone over in other threads, but what is the requirement to be a diver for Seahunt Forever? Eb, I can say this about 99.9% of the participation on the forum. People read, and glean information from it, but refuse to add anything, and yet they're the ones who'd bellyache about it being gone--I've been saying this for years now. BTW, this isn't aimed at you Eb, so please don't think it is It's more of my way of echoing what you said--GRRRR! But keep posting. I need something to read. I think for one page, that's a pretty healthy mix of topics. Add to that the various threads, such as this Sea Hunt 2017, and I think we have a pretty healthy site. Maybe we should rename this the Healthways forum That was totally in jest BTW! To be honest, I had played around with asking if we should have separate Healthways section? I'm not complaining or being really stoked about the Healthways saturation as of late... It seems like we get a couple new people interested in the subject and it just grows from there? If I had more money, time, etc. I'd love to attend to Sea Hunt Event. Maybe in a couple years? I have met most of the divers there I think, and one or two I almost met at a couple vintage events in my local area. I'd love to see us Divers who are interested in diving vintage gear get together more often in my local area. As for this forum...this is the only vintage scuba site I really go to. I am registered at another vintage site and I registered on Scuba Forum back when I was getting certified, but got disenchanted with both sites and only really share here anymore. I've tried to share this site with a couple other Divers who were interested in learning the ways of our ancestors, maybe they will show up someday? I also like what Eben said along the lines of showing others that Divers can safely dive and dive great with kit that was around in the earlier days of the sport. Being an ambassador to the world of vintage Scuba is a good thing and it sounds like there were more people interested in the sport when they left than when they showed up. Getting people interested in Diving is a good thing, showing them that it is possible to dive with older gear and be "successful" with it is a great thing. When ever I dive with vintage gear and no BC (which is actually the norm for me now) I get looks and sometimes comments. I try my best not to be a dork about it and come off as a safe, sane person. I like to share my videos so people can see what it was like there sort of from a behind the scenes look. That's why I placed my video camera off to the side. I have started pushing my diving back to the basics and I look for ways to re-create things from the past. I've taken the time to start reproducing decals for tanks that aren't available. 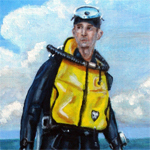 I'm actively supporting the Sea Hunt Forever event and there should be a full page article soon in our local newspaper. I didn't grow up in the Sea Hunt era. I grew up around Cousteau and a lot of my time and effort is focused on that era but I've grown now into the Sea Hunt equipment. I'm trying to save some very important dive equipment so they don't all get destroyed such as the UDS-1 unit. It was really fun to talk to Alec and Herman about them and learn from them. I brought a LOT of gear to Sea Hunt and I was able to almost fully equip another diver who got involved late and didn't have the equipment. I kept myself busy at the event and I know I was pushing my comfort zone and believe me I had a lot on my mind after getting interrupted at Saturday's dinner with tragic news about a loved one's death. I kept my focus and did what I had to do to promote this sport. I'm more of a reader here and I try to contribute when I can. I'm very late getting into the vintage game but that's OK because I've taken a brand new diver and showed her how to dive safely, she now is excited about the vintage game and wants to use the Heavy Yoke Royal AquaMaster I gave her for Christmas. She doesn't want to use the modern equipment now. That's kinda my two cents here. I contribute when I can but I'm always looking for answers and without places like this and the people who spend time here the answers go unanswered and that is frustrating for people.